A fast-acting carpet moth spray that can be applied to carpets and rugs, Pest Expert Formula 'C' kills carpet moths on contact and leaves behind an insecticidal residue that is effective for up to 12 weeks, offering long-lasting carpet moth control. 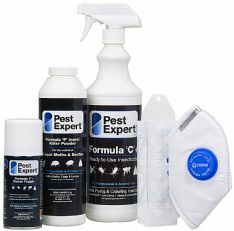 Pest Expert Formula 'C' Carpet Moth Spray is a water-based product that is both low-odour and solvent free, so it is safe to use in households with animals and/or young children as long as directions for use are followed and they are kept out of the treated area until surfaces are dry (approx 3 hours). This 1 litre container will typically provide effective coverage to an area of around 25 square metres. Heavy carpet moth infestations may require a second treatment. To carry out a carpet moth treatment using Formula 'C', lightly spray the carpet, applying more product to specific areas of damage. A heavier application should also be administered around the edges of the room, which should save you the trouble of having to lift and treat beneath the edges of the carpet. Leave the room and allow around 3-4 hours for surfaces to dry before returning. Avoid vacuuming for as long as possible after treatment as this will remove the insecticidal residue and reduce efficacy. As an extra line of treatment, you may also wish to fumigate a room using our Formula 'P' Moth Killing Fogger (see related products below). Alternatively, please see our Carpet Moth Killer Kits which contain Formula 'C' Carpet Moth Spray as well as Formula 'P' Carpet Moth Powder, Formula 'P' Foggers and Demi Diamond Moth Traps, are supplied with step-by-step instructions and offer excellent value for money. Formula 'C' Carpet Moth Spray is supplied with a free EN149 Safety Mask and Nitrile Safety Gloves, strongly recommended when applying any moth killer sprays or quality insecticides! Brilliant at killing all of the moths - not even found any eggs! All carpet moths in my house have been killed! The perfect treatment for carpet moths! Horrid things! Good communication, rapid delivery, excellent product. As above. Happy with the transaction. Brilliant service First class service as delivery received the next day after ordering. Product works as described. Has significantly reduced our moth population. No complaints at all Mothkiller was very efficient my order and delivery was done within 3 days would recommend this company to anyone. Excellent online service. Ordered online in afternoon, delivered next morning. Brilliant. The liquid clearly kills the individual larvae. And generally spraying the carpet seems to slow down the lifecycle. AND, the size of the bottle is BIG - will last for a whole house. Excellent service and excellent product that I cannot rate highly enough. Had tried other products but this is the one that has worked. Great product, quick delivery, it's done the job first time. Very good service, helpline staff gave me the answers I needed and delivery was within 5 minutes of their predicted arrival time. Highly recommend! I bought a moth killer spray for my rug. It was delivered the next day and looks like all the beasties have gone! Materials came quickly and was able to amend delivery date when goods were already on van. carpet moth treatment delivery of products was prompt . Treatment has been applied in accordance with the instructions and no evidence of further moth activity . So far so good ! I ordered fumigator and killer spray to resolve carpet moth issues. Both arrived in a very timely manner and were easy and effective to use. Wished I found these products at the outset. I would recommend products and company to anyone unlucky enough to be blighted by carpet moths. Finally something that really works I had a problem with carpet moth for a while now and tried variety of different products and techniques. Nothing seemed to work. Eventually ordered Pest Expert Formula 'C' Carpet Moth Spray and received it the next working day. After spraying throughout the whole carpet have not seen a single moth flying around for a few days. Very pleased with results so far. One application & one follow up to to be sure as recommended. All carpet beetles (moths) gone. No smell, no mess all finished in under 75mins (including moving furniture) & 3 Hours later the room back as it was. Your formular C, 'FANTASTIC'. Moth killer purchase Very quick and efficient purchase with a speedy delivery. Highly recommend. Carpet moth treatment Very good response and rapid delivery. Product easy to use. Good information. Can't say if it will work but hopeful! Great service, quality product, 100% satisfied. I found evidence of moth eggs (like small grains of rice) under a dark wood cupboard in the lounge. Went online to look up something I could buy and try and get rid of them myself. MothKiller stood out as website explained sort of moths I had etc and what sort of product I needed. Ordered online and as promised goods arrived next day - simple and easy. Still a bit early to say if moths completely gone but so far so good. Would recommend this company. Used the spray once and the amount of carpet moths flying around each night diminished considerably. In just two days they seem to have gone completely. My order arrived quickly and was easy to use. Hopefully my nights of killing the moths are over! mothless Carpet moths seem to have stopped. Nothing else has worked. Just this. Super efficient, effective product. I had real problems getting any suitable product locally, but received this the next day. Marvellous!! Materials came quickly and was able to amend delivery date when goods were already on van. Too early to tell if chemicals work. Great service, knowledgeable helpline, can't fault it! very good service, helpline staff gave me the answers I needed and the delivery was within 56 minutes of their predicted arrival time. Highly recommend! Carpet Moths. Speedy delivery of products ordered. Good instructions and, so far, successful treatment of the problem. Thank you. My opinion. Superb the product and especially the service, thankyou. Great service. Product arrived very speedily and well packaged. Ordered because of an infestation of carpet moths. I followed the instructions and so far no sight of the little blighters. I was a bit concerned as I have inquisitive cats but ensured the area was clocked off and all went well. Fast & easy - One application & one follow up to be sure as recommended. All carpet moths gone. No smell, no mess all finished in under 75mins (including moving furniture) & 3 Hours later the room back as it was. Your formula C, 'FANTASTIC'. One very satisfied customer - I ordered fumigator and killer spray to resolve carpet moth issues. Both arrived in a very timely manner and were easy and effective to use. Wished I found these products at the outset. I would recommend products and company to anyone unlucky enough to be blighted by carpet moths. Having had the moth infestation for quite a while. I had tried everything that I could think of and thanks to Google found your company. Application was pretty easy and although only done today - the evidence of dead moths, larvae all over the place is making me a happy person! The carpet will be replaced soon as the damage was pretty bad - but if it gets no worse than it is then it makes the kit a very good investment! After being plagued by carpet moths we ordered Formula C moth spray from Moth Killer. One application on the affected carpets was all that was needed and the result has been astonishing because for the six months since that application not a single moth has been seen. I can highly recommend this company and its products to any one who has a carpet moth problem.